We are starting to see the first wave of these devices hitting the mainstream, with fitness trackers, smart watches, and smart home thermostats gaining popularity. In the next few years, the Internet of Things will affect nearly every aspect of our lives, from medical care, to shopping, to entertainment, and definitely to sports. Major League Baseball has a reputation for being resistant to change, but that is only particularly true on the field. (It was the last major sport to adopt replay, for example.) Off the field, baseball as a sport has been on the forefront of innovation. Analytics, fantasy sports, farm systems and players unions are just a few of the trends that started in baseball before bleeding into other sports. The Internet of Things will make its way onto major league fields in time, but the trend will begin with front offices, amateur ranks and hobbyists. If these devices can offer a competitive advantage — and there is little doubt they can — then all it will take is the spark of a few innovative teams that have success to light a wildfire that will spread to the rest of the league the same way sabermetrics did in the last decade. The Internet of Things is on the cusp of joining baseball off the field and, in time, on it. This is the first in a two-part series looking at how technology will change baseball over the next decade. Part one will focus on devices that are the most baseball-specific and ready for practical use. Part two will look further down the road to technologies still in development and/or not yet used in a baseball context. 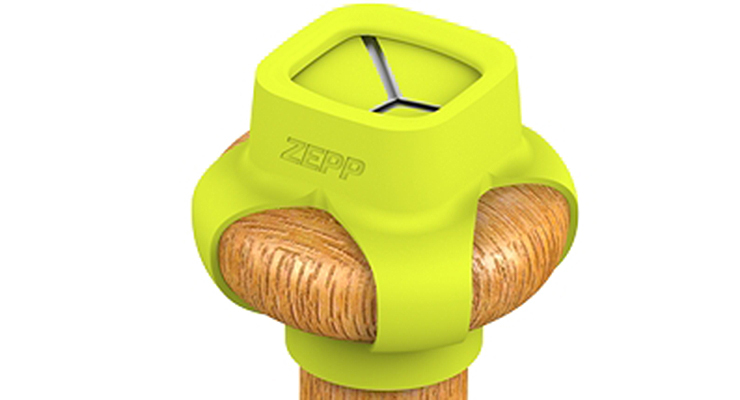 There already are three companies with swing trackers in the market: Blast Motion, Diamond Kinetics and Zepp. A swing tracker is a small sensor, about the size of a stack of nickels, that attaches to the knob of a baseball bat and can measure the position and movement of the bat. 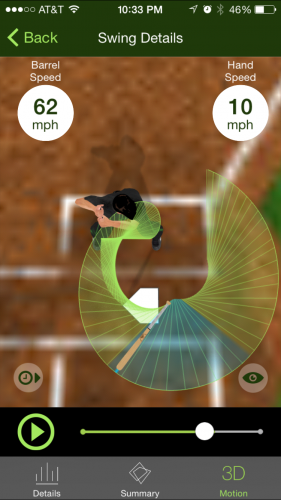 It sends those data to an accompanying app on a smart phone or tablet, and the player can see a new stream of data about his or her swing, for example: hand speed, barrel speed, time to impact and bat angle. Depending on the device, the apps also includes functionalities such as 3D renderings and slow-motion video of the swing. The goal is to help the player make adjustments to his or her swing and ultimately become a better hitter. It is the perfect example of the type of device that could not have existed a few years ago but will become ubiquitous as the technology gets smaller and cheaper. The most direct comparison for how bat trackers will be used is how radar guns are used with respect to pitchers today. It puts a number on a previously subjective evaluation. Whereas radar guns have become an essential tool to evaluating pitchers at all levels, there has not been an equivalent device for hitters. Bat trackers could be that device and more. The ability to measure every aspect of a swing means more data as opposed to the single miles per hour number of a radar gun. The depth of data coming from a swing tracker is preferable to the single radar gun number, but it also means added complexity. This could hinder adoption, at least initially. The evaluation of a swing can be complex. There are different kinds of hitters, meaning a coach cannot use just one or two statistics coming from the bat tracker for each of his players. This is a screen shot of the Blast Motion baseball app. The Blast Motion device allows users to take video of their swing, then automatically edits the video for quick reference and analysis. Using swing tracking data, Bentley said, a coaching staff can better identify the hitters who are injury risks and those who would benefit the most from strength training. Each of the companies interviewed for this story made it clear its devices are not perfect substitutes for a scout. Like a radar gun, it is a new tool that can help a scout make a more accurate report. This is a screen shot of the Diamond Kinetics app, showing a 3D rendering of a swing. The user is able to view the swing from multiple angles and play back the bat location at any point during the swing. Measuring bat speed, angle, and acceleration is possible without a bat tracker. There are batting cages across the country where coaches can use video to capture these data. The real breakthrough with bat trackers is the democratization of those data. 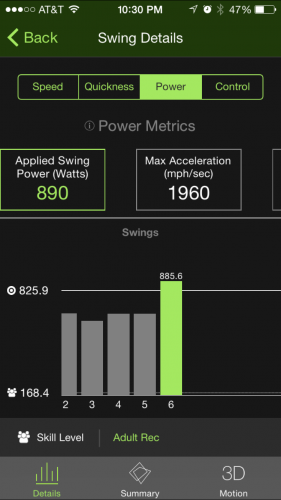 These devices allow for easier, cheaper access to swing data. This means more hitters who will have the data, and bigger databases with more swings and longer histories per player. 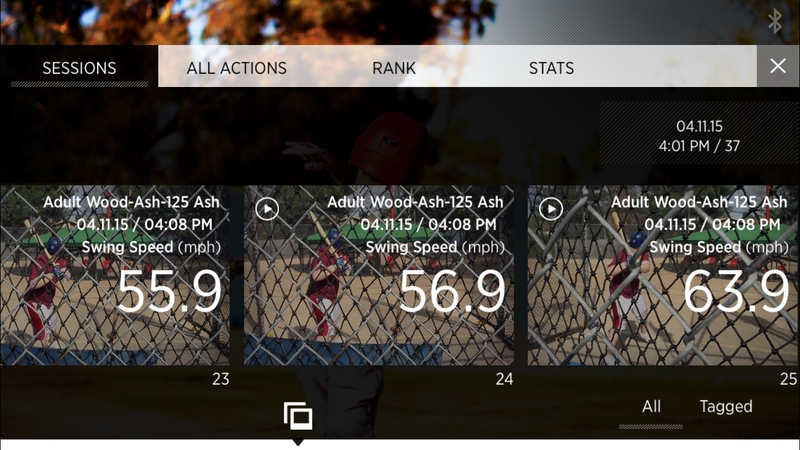 This is a screen shot of the Diamond Kinetics app, showing some of the statistics available to the user after a session. A popular trend among young players today is to make highlight videos for YouTube. That is a fun way to show off a few good swings and try to generate buzz for scouts, but imagine the impact of a young player sending a coach a spreadsheet with years of swing data, with categories for pitch type and location. Conversely, maybe scouts of the future will look at data before seeing the player then use the trip to verify his conclusions. Sports technology company Motus Global has created a sleeve for pitchers to wear while pitching called the mThrow. This device contains a small sensor embedded in the sleeve that can measure the pitcher’s motion in a similar way to how a swing tracker measures bat movement. The mThrow can provide data which can be used to help improve the pitcher’s delivery, measure fatigue, prevent injuries, and rehab after injuries. Injury prevention in particular is a hot topic right now, given the number of Tommy John surgeries in the major leagues over the past few years. Nolan said the mThrow is not a magic bullet to end pitching injuries. It is simply a data source that may contribute to the understanding of the problem. Practicing with the device will provide some data, but ultimately, pitchers wearing the sleeve in games will need to be approved in order to see the full benefit. Once approved for in-game, major league use, the mThrow or a similar device could help quantify the pitcher’s fatigue level. Nolan said in the in-game testing his company has done, it found a noticeable difference in elbow height as the game progressed. Having demoed the swing trackers, I can attest that they hardly change the feel of a bat at all. Given, I am not a professional athlete. Considering players have been known to recognize the difference between two baseballs, I do not doubt they would notice a swing tracker. Motus’ sleeve, although an elegant design, is clearly noticeable to the wearer. Will the physical devices be what holds them back from adoption by players? Unlikely. Considering several players today wear magnetic necklaces and bracelets that do nothing, I doubt most players will have an issue wearing a piece of technology if they know it can help their game and prevent injuries. Further, the current form factors of these types of devices will continue to evolve and shrink. We likely will look back at this generation of swing trackers the same way we look at the first generations of mobile phones. Before long, a swing tracker will be no bigger than a bat knob sticker or embedded in the bat itself. In a few years, pitching sensors could be a sticker instead of a sleeve. In-game use is another hurdle wearable devices will have to overcome. Today, in-game use of electronic devices is not allowed in the majors and most competitive leagues. As stated earlier, baseball typically is slow to change anything on the field of play, so there will need to be significant pressure from players and fans before we see any of these devices used during a major league game. Handron also said he believes fan experience will lead baseball into allowing more technology during games. The first generation of wearable devices is in market today, and sports teams around the world are already putting these devices to work. The Golden State Warriors are using clothes with embedded sensors to measure workouts. The German national soccer team used wearable devices to optimize practice workloads prior to the 2014 World Cup, which they won. The Internet of Things is a tidal wave that is starting to hit shore. Looking further down the road at the technology that will affect baseball five or 10 years from now, things really begin to resemble science fiction. We will take a stroll down that road in part two. Jesse has been writing for FanGraphs since 2010. He is the director of Consumer Insights at GroupM Next, the innovation unit of GroupM, the world’s largest global media investment management operation. Follow him on Twitter @jesseberger. A very informative article about technology I never knew existed. Both pieces of technology could instantly help the batter and the pitcher, which I support. A question I would pose is at what point does technology become overbearing in baseball in which there could be too much data to help individual performance and mess with the baseball players mental game in trying to make adjustments? I never thought that it was impossible to have a left-handed catcher, just that if you have a lefty that can throw that hard, he would be a pitcher. When I tested the swing trackers, I couldn’t tell the difference at all, but I have no doubts that a major-leaguer could. In terms of form factor, you can’t beat video technology. The true innovation in swing trackers is having video-like functionality in any back field, batting cage, or high school field. That’s assuming, of course, that the swing trackers have video-like accuracy, which hasn’t been verified. And even then, you lose a lot of useful information about the “kinetic chain” (especially in the lower body) during the swing by just focusing on the bat path. Don’t get me wrong, I’m way into these things, but they’re no silver bullet. Yeah, I know Matt Holliday – when he was in Colorado – would send bats back just after touching them because he said he knew if they were light or heavy in certain spots. Ted Williams supposedly did that too. I wonder if the characteristics produced by the bat tracker of speed and potentially angle could be characterized for each player, allowing a player to be recognized according to the data. I guess an easier solution is just to have bats dedicated to each player. And a cheaper solution would be to have one bat and have a coach assign each swing to a player. For MLB players, I bet the swings are distinct enough to where you could build a pretty reliable classifier, but especially at the youth level (which is their target market) there’s probably so much variation from one swing to the next that you’d end up with huge amounts of overlap. This is not what the “Internet of Things” is about whatsoever, beyond awful attempts at marketing, because none of the functionality of these things depend on network connectivity beyond temporary storage or possible integration into an app. This is more an example of ubiquitous computing or miniaturized sensor systems. I agree. It is a misuse of IoT by these companies trying to catch a marketing wave. What we read has nothing to do with IoT. But the article is informative nonetheless. A very interesting read. Very much agree with he post that this is not IoT. This is more along the lines of “Big Data Baseball”. In fact, there is a new book out called exactly that. Interesting stuff, and was a instrumental in turning the Pirates around after 20 losing seasons.